Peter Brookes has sent the following to the LSSC. We are glad he enjoyed his experience. it all calmly and meticulously and the whole experience of shadowing him gave me an excellent insight as to just how much work is put into "getting the show on the road!" For those that aren't members of the supporters club, then I would suggest for the nominal subscription, it's well worth joining, not only for the possible oppportunity to get a different perspective of a meeting from behind the scenes, but also to support all of the good work that you and the committee do in supporting the team. Thank you all very much for making it all happen! It's pretty certain that John Smith will be known to many supporters. 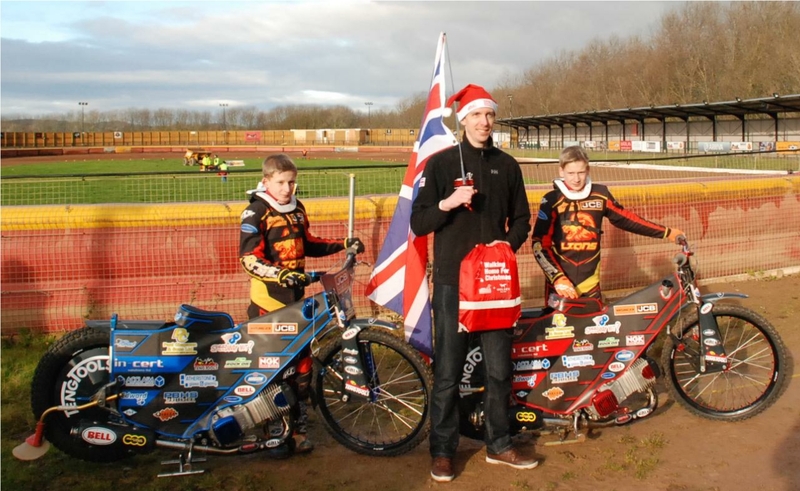 A man so committed to his sport that he even had his 1996 wedding at Long Eaton Speedway! 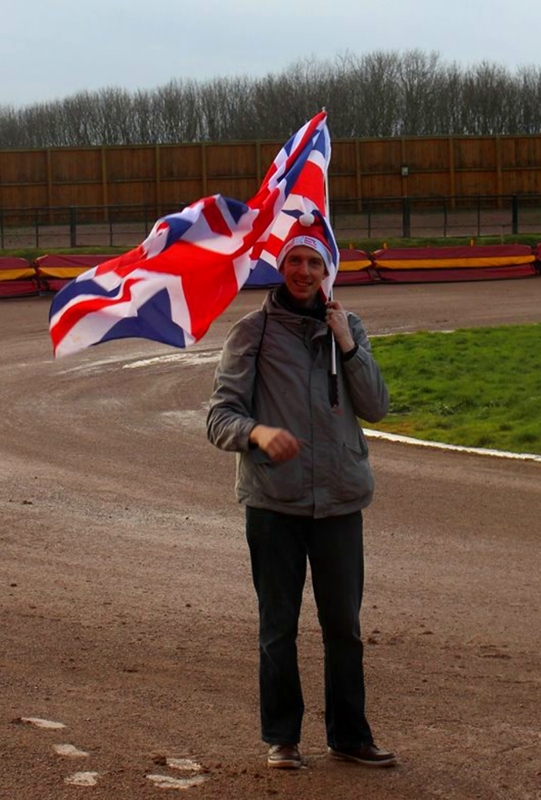 The photographic evidence opposite was provided to us by his fellow LSSC member and speedway loving wife, Pauline! neighbours to the sport. His Mini of 1971 even had the registration number of RAY 789 G! They both were as active as possible in supporting the bid to bring the sport back to Leicester. Since the new era started John has been a season ticket holder. He has missed none of Leicester’s home meetings.He is a complete anorak in that he has kept track of all the matches he has attended. 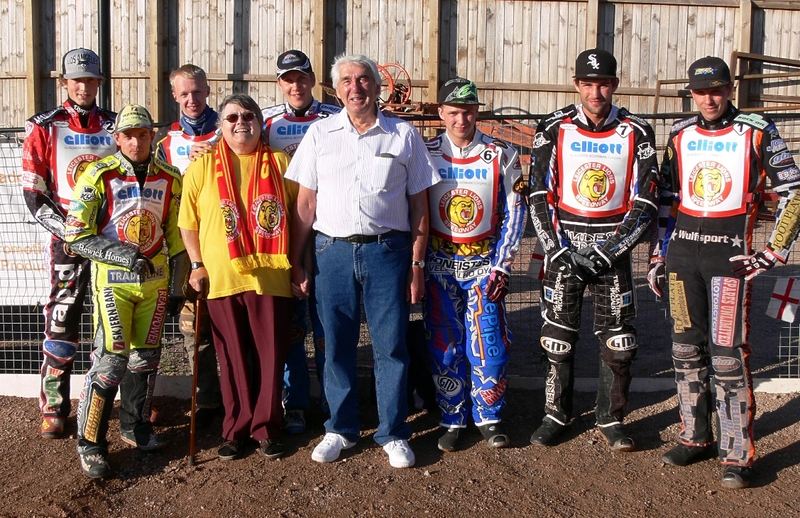 To date he has been to matches., When he was 70 his wife Pauline arranged a VIP evening with friends and family/ They had their photo taken with the 2012 Leicester Lions. 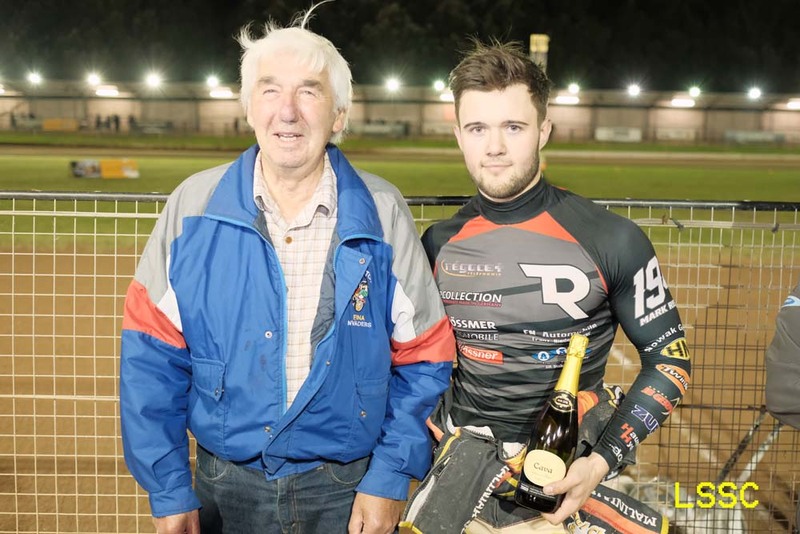 Last year John was chosen to present the Rider of the Night to Eric Riss. His favourite moment of the new era was in 2014 when Jason Doyle and KB squeezed Bjarne Pedersen on the third bend in the match against Eastbourne to get a 5-1. Her worst moments have been with the lack os success of the team. He hopes that 2018 will change all that. His worst moment has to be when the Leicester v Birmingham match was rained off in 1983. The restaging was three days later on the Friday. Unfortunately John was committed to taking some friends to see Leo Sayer that night and couldn't get out of it. It rained all day and John was hopeful that it would be cancelled again, but it wasn't. One of the best moments at home was a match against the local foes Coventry. It was a wet night and there were puddles on the track. Mark Courtney was racing Ole Olsen. Every time he passed the bends he stretched out his foot through the puddles and covered Ole who was behind - and not very happy. 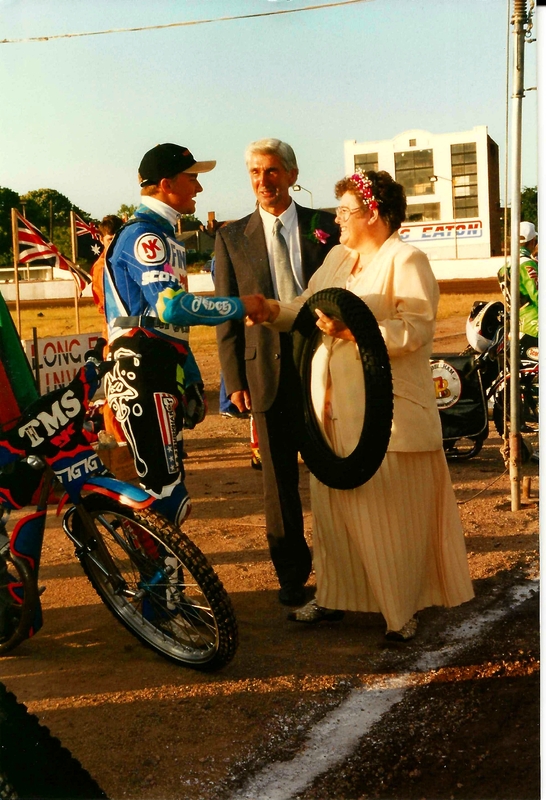 John met his wife at the Speedway and they got married on a Wednesday so that they could go to the speedway at night and even had their honeymoon the week before their wedding so that they could see their team away at Poole and Exeter This was in 1996 and they followed Long Eaton. His wife is a long time Halifax, Bradford and Sheffield supporter (travelling to Leicester many times to see classic matches between the Lions and the Dukes) and still follows the sport with him. 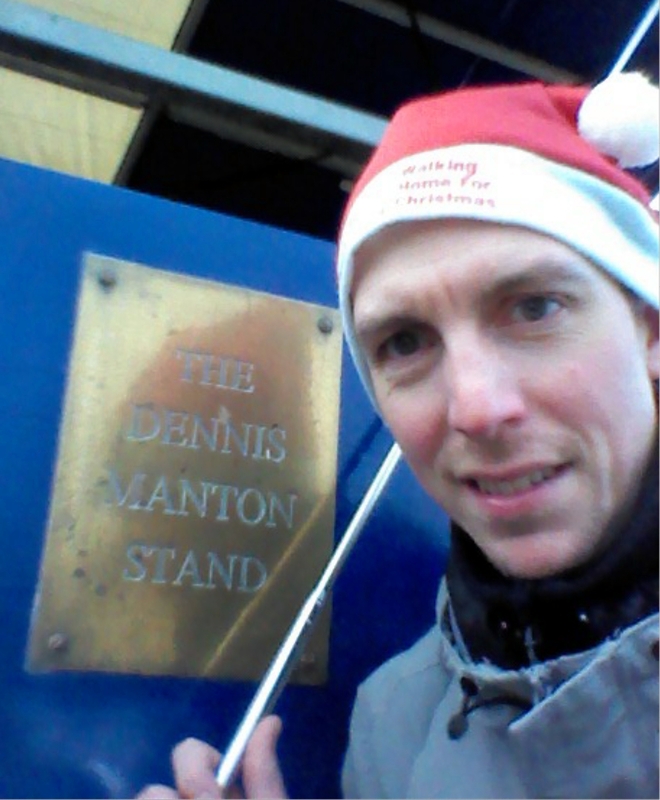 To end the year on a positive note, Alex Kowal completed his 20 mile walk for 'Walking with the Wounded'. He walked round the Leicester Track as part of his journey. Well done Alex. We are all looking forward to the new season. The charity helps to fight the threat of the ex-service men and women, who due to mental illnesses and physical injuries have lost their jobs and their homes. 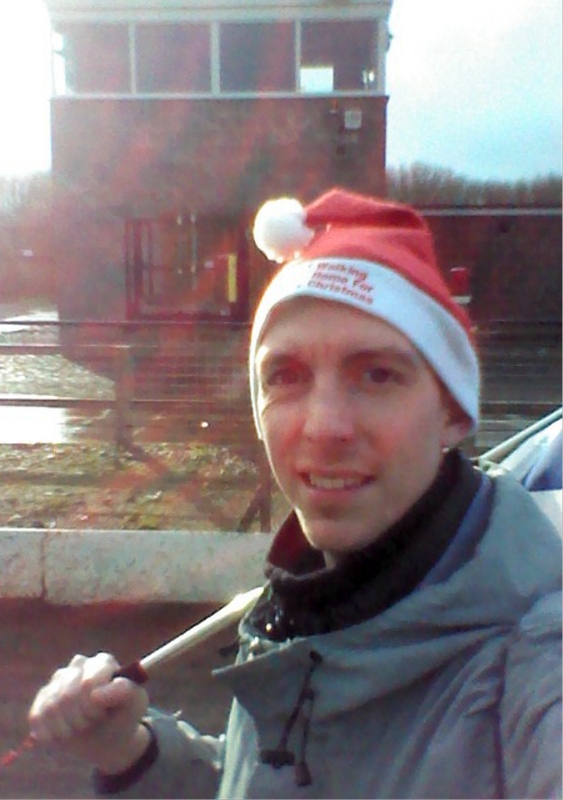 On Saturday 16th December, I will be making a 20 mile walk from Loughborough to my home in Wigston. On my way I will be visiting Leicester's own sports venues. My journey will start at 9:00am at the athletics track in Loughbourough. My other destinations are Leicester Arena, home to the Riders and Cobras basketball teams, The Leicester Tiger's Rugby ground, Leicester City's King Power Stadium, Leicestershire Foxes cricket ground, before my last stop at home. In between these destinations, I'll be walking to the Leicester Speedway at Beaumont Park . 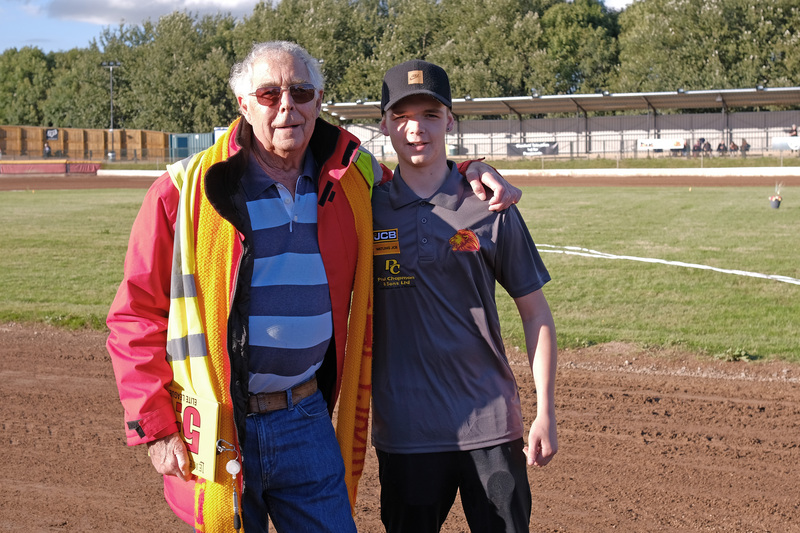 Alex Kowal has sent this story to us about two long serving fans. his father Michael and Ian Turvey. 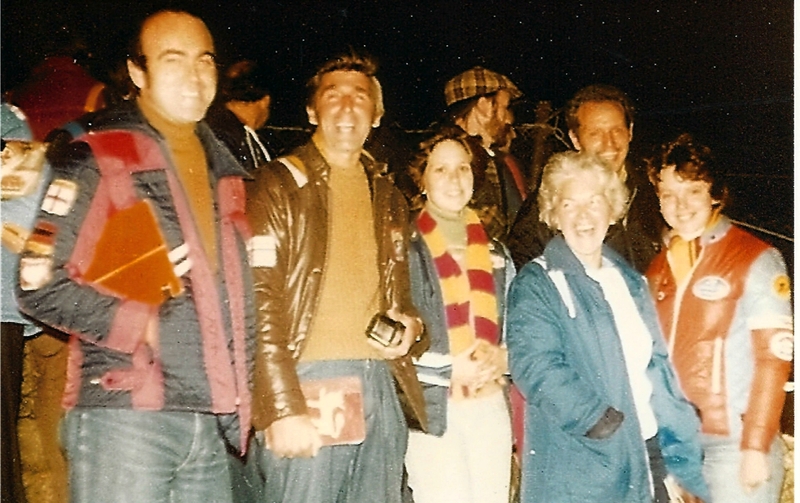 On 31st July 1977, several Lions fans travelled to King's Lynn as the Stars were hosting Leicester Lions. 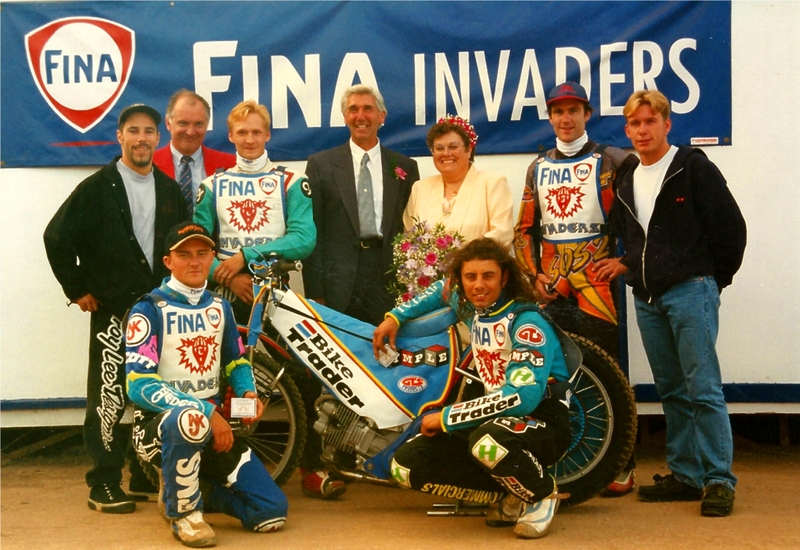 Ian Turvey (on the left of the photo) with his brother Chris on one side of the stadium and Michael Kowal (on the right of the photo) standing with his mate Steve Hamp on the other side. When the meeting ended, the Lions fans boarded the coach for home after Leicester were defeated 44-33. 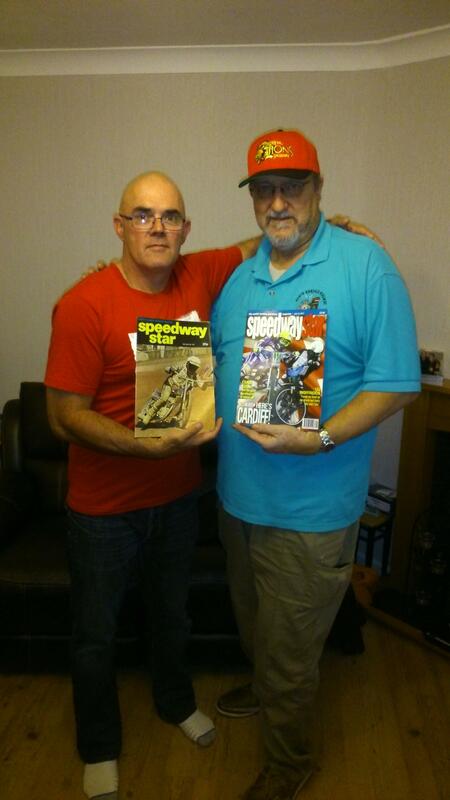 Ian and Chris were reading the speedway star, brought from the track shop, when Michael asked if he could have a quick look at the then 30p speedway magazine. This was when they first met and talked throughout the journey home about how good or how bad the Lions performance was. 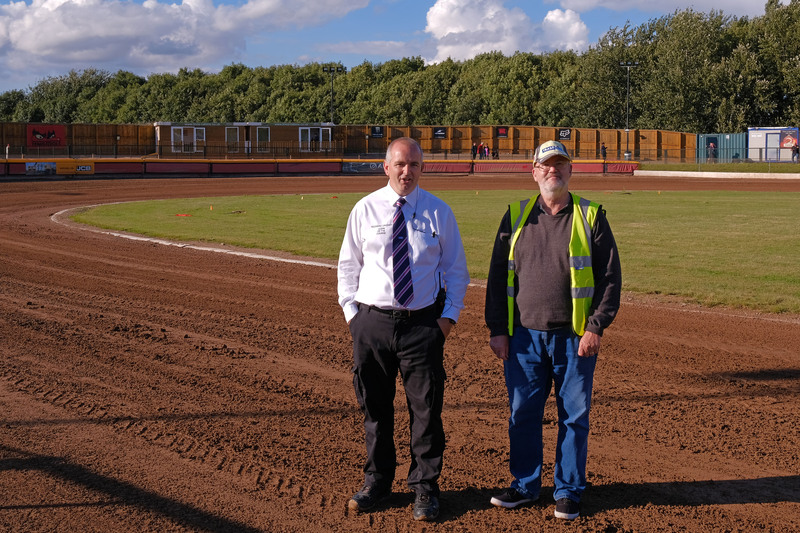 Since then, both Ian and Michael have attended speedway meetings together on the end of the fourth bend at Blackbird Road and many more away meetings. As time went by, Michael and Ian formed a strong friendship. Since then, Ian met and married Michael's sister-in-law Karen and had three children. Their youngest son James has since had a daughter Lilly. Then, Michael's nephew Stuart met and married Ian's sister Jane, who then had two daughters. My VIP evening was worth the membership money alone. It was a unique experience. The track walk was enlightening, listening to the riders’ perspective. Is was so busy in the pits and fast paced. It was great to see all our riders supporting each other. The team rode better tonight than the score belies. The referee was very helpful and clearly explained what was happening. Kyle Newman just had to be my rider of the night. Thankyou to the LSSC for making this happen. Monday July 24th 2017 was a special night for Howard Archer and John Beckett. 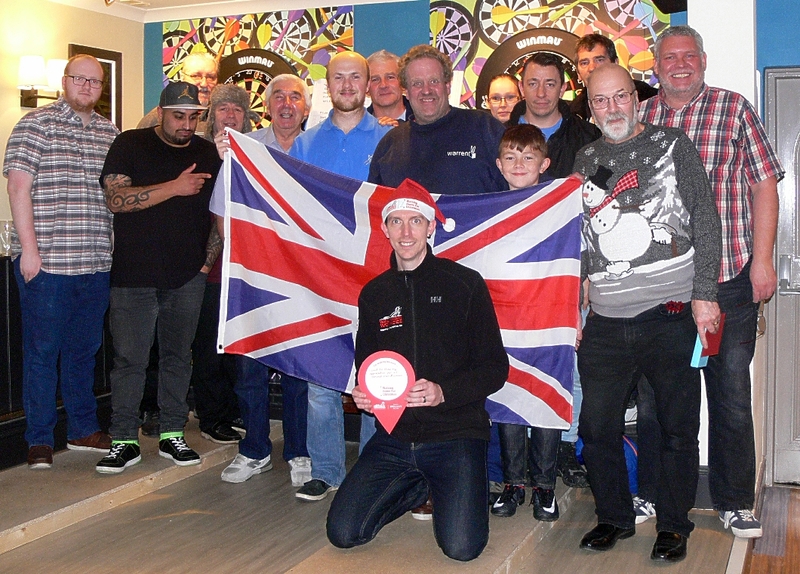 They had been chosen as LSSC members to shadow the Clerk of the Course (Howard) and be a VIP for the evening (John). This is what they thought about it. 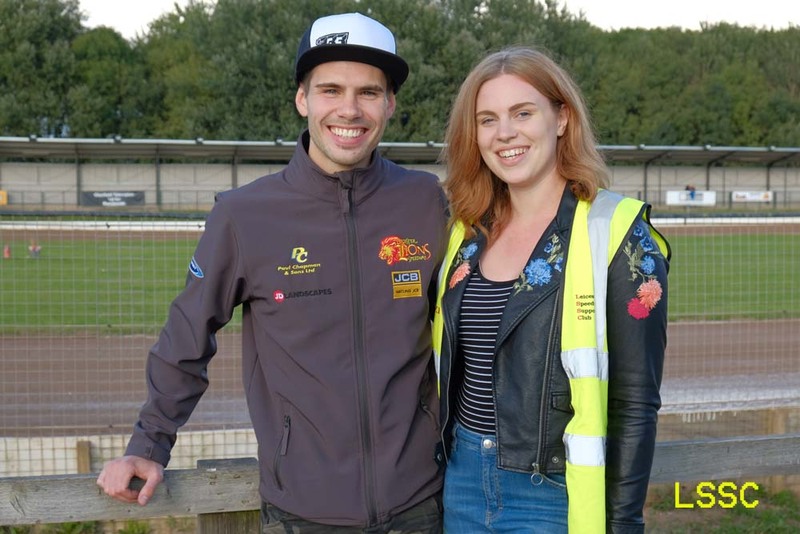 I must thank Richard Cassidy and all the staff at Leicester Speedway for a thoroughly enjoyable evening at the Kings Lynn match. Having attended well over a thousand meetings so far in my life it was fascinating to see what really goes on. If you have ever wondered from the terraces why things do or don’t happen this opportunity of shadowing the clerk of the course could answer all those questions. All the Leicester staff are very professional and hardworking but also very friendly. A special thankyou to Richard for answering my many questions particularly at the stressful time when there were issues with the sun affecting the riders vision. A final thought is that if you are like me and think you know what the clerk of the course does, then increase that thought at least tenfold and you might be nearly there. He is a very hardworking man. Finally I must thank the LSSC for giving me this opportunity. It is my first year as member of the LSSC and it won’t be the last. I have been a supporter of 68 years and I have never been in the pits until tonight. It was a great, great night. As I was an engineer I enjoyed watching the riders tune their engines. I even recorded the sound of them warming up on my iPhone. The walk round the track with the riders and listening to what they were saying about setups for the conditions was very interesting. Watching the racing from the rider’s viewpoint was certainly different. The visit to the referees box was a unique experience especially as there were 3 refs, one a trainee. Everyone I met was very friendly. It was a fabulous evening. I am so grateful to the LSSC for making this happen. It is worth being a member just for this.